4091 ⊙ 6Ib 2 ½ Rp. Deep black / brown red, wonderful fresh colors and large margins all around with neat and clear mounted black Federal lozenge. An outstanding quality this sought-after colour for the highest standards! (Zst. No. 14 Ib). Photo expertize Rellstab. SBK 2200,- Sfr. 4092 ⊙ 6Ib 2 ½ Rp. 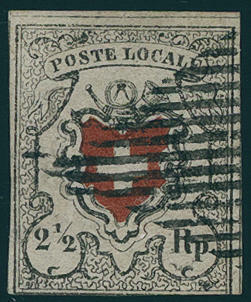 Poste Locale with framed cross, black / brownish red, tear in the middle, on document with centered \"P. P. \". Photo expertize Eichele. Michel 1400,- €. 4093 ✉ 6Ib,8II 2 ½ Rp. 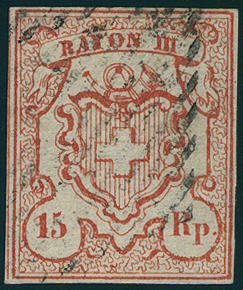 Deep black / brown red, Poste Locale with framed cross, right touched respectively slightly cut into, otherwise with wide margins in mixed franking with 10 Rp. Black / red / yellow in perfect condition on very nice cover the 2. 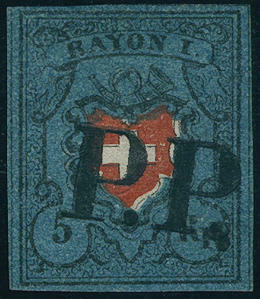 Weight step with two clean mounted blue \"P. P. \" in the circle and additional blue posting stamp \"NEUCHATEL 21. 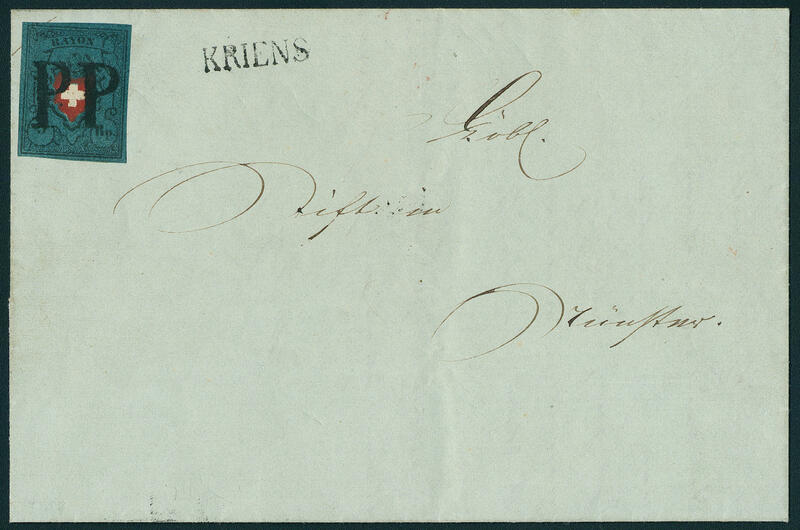 MARS 1851\" to Landeron. An especially attractive cover of this rare franking-combination! Photo expertize Rellstab / International Association for Philatelie Experts. 4094 ⊙ 6IIa 2 ½ Rp. Poste Locale without framed cross, wonderful fresh colors and large margins all around, small little tear in margin and here and there light, at the bottom on the right minimum corner crease. 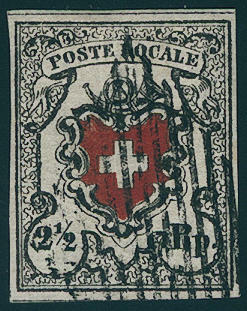 The stamp carries a centered Swiss lozenge. 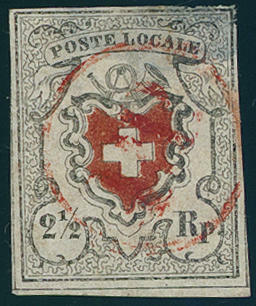 An attractive copy this large, nearly always missing Switzerland rarity! Photo expertize Hermann / SBPV. SBK 35000,- Sfr. 4095 ⊙ 6IIb 2 ½ Rp. Black / brownish red, Poste Locale without framed cross, wonderful fresh colors and three sided with wide margins, lower margin line touched, with clear Federal lozenge. 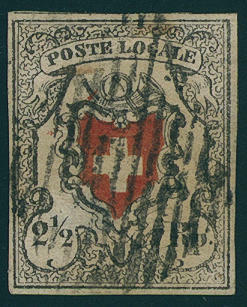 A beautiful copy this large Switzerland rarity, the in almost all collections is absent! Photo certificates Alain von der Weid / SBPV, Eichele. SBK 35000,- Sfr. 4096 ⊙ 6IPFI 2 ½ Rp. 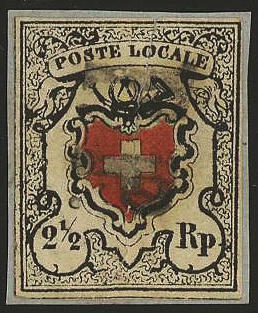 Poste Locale with framed cross, the scarce so-called 1. Printing, fresh colors, reverse large thin spot, on all sides full margins with red \"P. P. \" in the circle, photo expertize Trüssel / SBPV. Michel 3000,- €. 4097 ⊙ 7Ia 5 Rp. Black / red / dark blue, Rayon I with framed cross, wonderful fresh colors and large margins all around, left and right with complete intermediate lines and centered, pricked clear \"P. P. \". An outstanding quality for your highest requirements! Photo expertize \"excellent and perfect quality\" Rellstab. 4098 ✉ 7II 5 Rp. 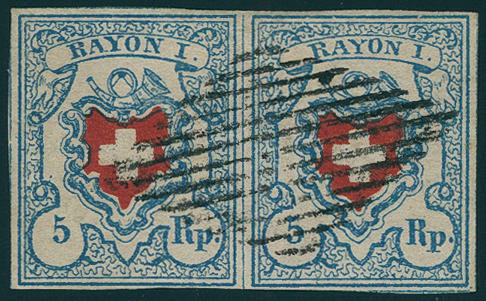 Black / red / blue, without framed cross, fresh colors and in perfect condition margins on very nice cover with especially clear mounted \"P. P. \" and additional clear red two ring cancel \"St. Gallen morning 1. June 1851\", as well red one-line cancel \"too late\" to Gossau. Outstanding quality! Photo expertize Marchand / SBPV. 4099 ✉ 7II 5 Rp. Dark blue / black / red, wonderful depth colored, on all sides piece in outstanding quality with enormous margins with perfect centered, pricked clear \"PP\" and additional likewise clear single line cancel \"KRIENS\" to cathedral with on the back red transit cancellation \"Lucerne 16. November 1850. \". An especially nice letter in outstanding quality from the 2. Issue month for your highest requirements! Photo expertize \"perfect quality\" Alain von der Weid / SBPV. 4100 ✉ 7II,8IIa 5 Rp. Black / red / dark blue without framed cross in mixed franking with 10 Rp. Black / red / yellow without framed cross (stone A2-RO), both values fresh colors and on all sides good to wide margins, in each case with centered and clean mounted \"P. P. \" on C. O. D. Cover with additional two ring cancel \"WILLISAU 19. January 51. \" to Lucerne. 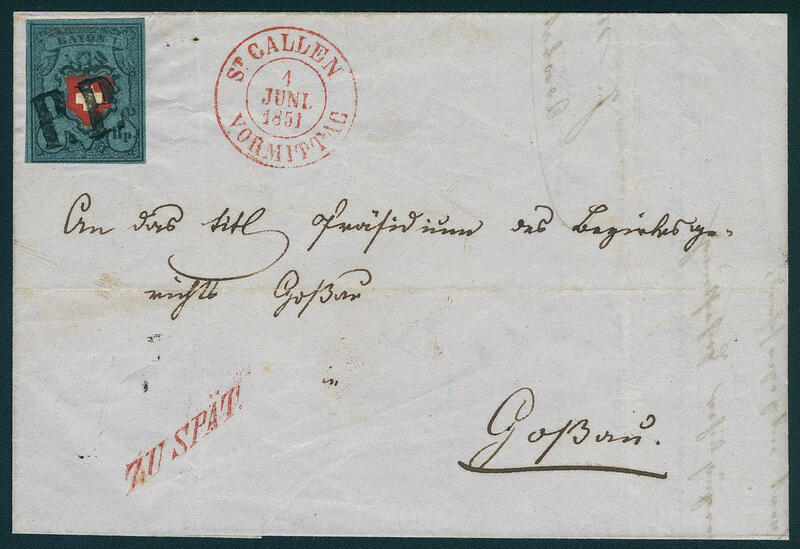 A very nice cover of this rare franking-combination. Outstanding quality! Photo expertize \"perfect quality\" Alain von der Weid / SBPV. 4101 ⊙ 7IIa 5 Rp. Black / red / dark blue without framed cross, fresh colors, on all sides good to wide margins, above with parts of the neighbour, with centered black \"P. D. \". Outstanding quality! Photo expertize Eichele. 4102 ✉ 7IIa,8IIa 5 Rp. 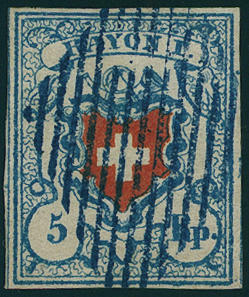 Black / dark blue / red, without framed cross (type 38) in mixed franking with 10 Rp. Black / red / yellow, without framed cross (type 36, lithographic stone A1), both values illuminating fresh colors and large margins all around with in each case centered clear red \"P. P. \" and additional clear red two ring cancel \"Lucerne 12. 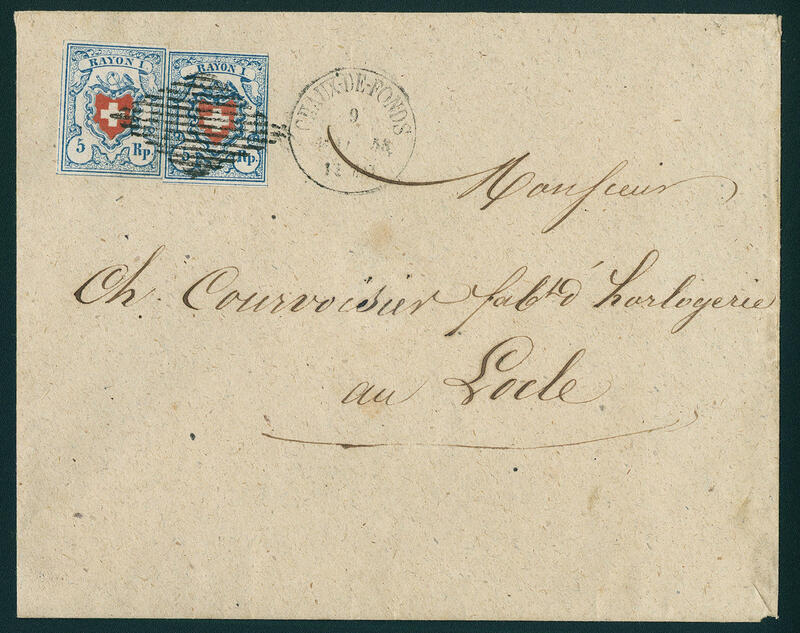 DEC. 1850\" on C. O. D. Cover to Solothurn. A dreamlike nice letter in outstanding quality, the even highest quality claims just becomes! Photo expertize \"excellent condition\" Rellstab. 4103 ⊙ 7IIf 5 Rp. 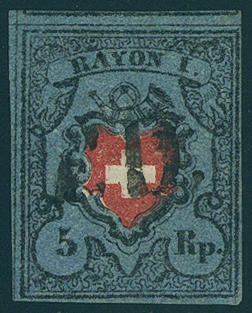 Rayon I, dark blue / black / bright carmine red, vertical pair in very fresh vivid colour, on all sides good margins (type 8 and 16), as well upper stamp with plate flaw \"coat of arms frame left at the bottom broken\", in perfect condition with \"P. P. \" from St. Gallen. A rarity the Rayon issues in perfect condition! Photo expertize Renggli. Michel 4500,- €. 4104 ✉ 8II,12 10 Rp. Black / red / yellow, lithographic stone D, horizontal pair, on all sides full- to having huge margins above with group distance, right with margin of sheet in combination with 15 Rp. 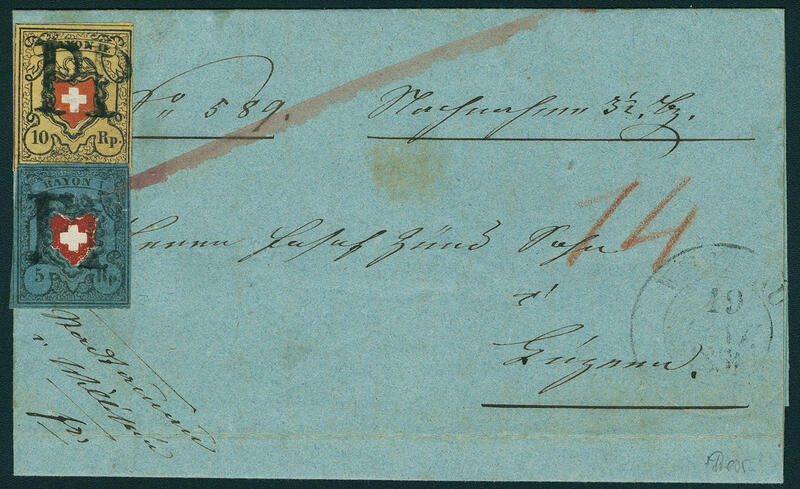 Brick red, fresh colors and large margins all around on decorative small-format cover as very scarce international franking with two clean mounted black confederate lozenges and additional black oval cancel \"PD\", as well single circle postmark \"Delêmont 1. AOUT. 54. 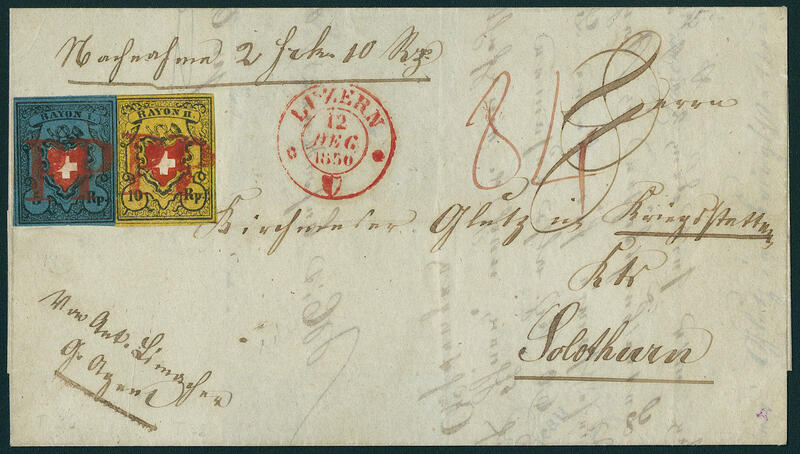 \" to Besancon / France with red oval cancel \"7 A. E. D. \" and on the back transit and arrival postmarks. 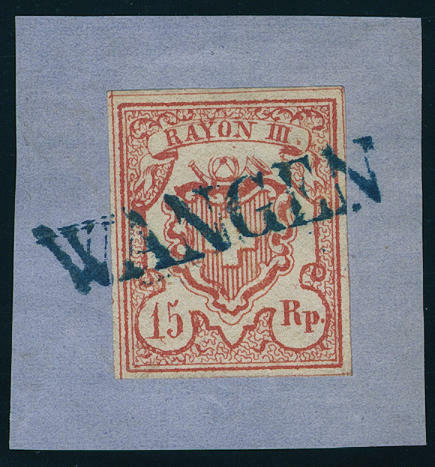 Foreign country postage the Rayon issues are extraordinarily rare, whereby it be here about an exceptional attractive copy act. Photo expertize Rellstab / SBPV. 4105 ⊙ 8IIB1 10 Rp. 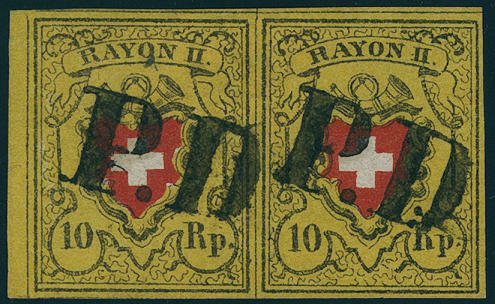 Black / yellow / red, rare lithographic stone B1, horizontal pair from left margin of sheet, wonderful fresh colors and on all sides perfect margins with two perfect mounted, crystal clear \"P. D. \" from Lausanne. There are only few pairs from this lithographic stone have become known, whereby it be herewith about the utterly most beautiful piece act. A piece of dream for your highest requirements! Photo expertize Alain von der Weid / SBPV. 4106 ⊙ 9II 5 Rp. Blue / red without framed cross, lithographic stone C2, horizontal pair, wonderful fresh colors and on all sides good margins with centric mounted black Federal lozenge. Outstanding quality! Photo expertize from the Weid. 4107 ⊙ 9II 5 Rp. Pale blue / red, rare stone B3 RU, type 29, wonderful fresh colors and good margins with clear blue Federal lozenge. An outstanding quality for the highest standards! Photo expertize Eichele. 4108 ✉ 9IIC1 5 Rp. Pale blue / red, without framed cross, stone C1-LO, two examples, wonderful fresh colors, right stamp left above touched lightly, otherwise large margins all around on very nice cover with clear passing over rosette and additional single circle postmark \"CHAUX DE FONDS 9. May. 53. \" to Locle. A very attractive cover! Photo expertize Berra-Gautschy / International Association for Philatelie Experts. 4110 ∆ 12 15 Rp. Brick red, illuminating fresh colors, large margins all around, a tiny ink line removed, on beautiful letter piece with all perfect, pricked clear blue single line cancel \"WANGEN\". An unusual decorative exception copy for high standards! Photo expertize Rellstab.